Naming the Money is a spectacular installation made up of 100 life-size painted cut-out figures. This is the story of the slave/servant but also of the emigre and the asylum seeker. Each cut-out has a real name, each one is able to to say who they actually are but each one lives with their new name and their new unpaid occupation attempting somehow to reconcile the two. Every person in the installation is trying to tell you something, each has a voice that can be heard via the soundtrack playing in the gallery space or as text on an invoice collaged to his/her back. There are ten ceramicists, ten herbalists, ten toy makers, ten dog trainers, ten drummers, ten viol de gamba players, ten dancers, ten shoemakers, ten map makers and ten painters. The idea of a portrait as the likeness of a person, and to some extent a revelation of the inner character, is turned on its head when examining portraits of black servants. Whilst undoubtedly they often do record appearance, this is rarely their primary purpose. Particularly in those paintings where they appear with their master or mistress, the role of the servant is merely to enhance the appearance and character ot the other person portrayed. The identity, personality, hopes and aspirations of the servant are at most secondary, more usually, entirely absent. This is no surprise he who pays the piper, calls the tune; but these portraits give us tantalisingly fleeting glimpses of the lives of these imported servants. That black servants appear in so many portraits demonstrates the prominent role which they played in domestic life. But they remain unknown and in the shadows. 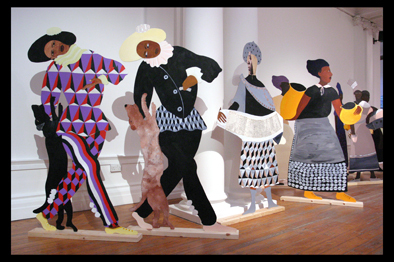 Lubaina Himid’s installation Naming The Money reveals the hidden history of black slaves and servants. It gives forgotten individuals a voice, the unknown supporting characters a name and a history. When I began this project I was convinced that it was about money. It has certainly cost a great deal of money to make. Its true that Naming the Money is about how the monied classes all over Europe have spent their loot, flaunted their power and wealth by using Africans as slaves. The installation shows how this was disguised and glamorised; they looked like servants or were dressed in the clothes of courtiers, they often provided the entertainment just by looking different and were at their most useful as the greatest conspicuous display of wealth imaginable. As I’ve said, the original title was Gifts to Kings. I think about money a great deal, as you will know by reading my emails to you, especially in the making of an art project. In the 21st century it is difficult to make work that will be taken seriously unless you throw serious money at it. Artists need space to make the work, or they need to employ technicians to make the stuff in their workshops. Art is usually made out of something, even if it is a technological piece, materials and people are usually needed as part of a film, video or even sound work. New Technology work is perhaps the most obviously expensive to make especially initial outlay on the best equipment with all the latest capabilities. However, plain old fashioned materials tend to be expensive if you want the thing to last and be treated with any kind of respect by those dear conservators who hold considerable power in discussions about purchasing for the major collections in Britain. Transporting finished art or original materials to the studio, to the workshop, to the gallery and back again costs money. Photographing your artwork for publicity purposes, costs money. Travelling to do your research all over the country, or around the world, costs money. Even going to the gallery in which the work is to be shown costs money. Staying in your studio and waiting for the curator to have the time to come to you is pleasurable, but if you do it properly even that costs money. Warm studio, decent tea and good biscuits are the way to the curators heart. Finished, exhibited pieces need to be stored somewhere, so artists either need a large studio or a large house or will need to pay for storage on a monthly basis Or someone needs to buy it all. I thought this installation was about re-iterating the facts and highlighting the immense contribution that Africans have made to the economic foundation of Europe. Entire cities have been built and maintained with the wealth created by the trade in tobacco, sugar and the slaves themselves. Everyone knows that the trade in people only stopped because the profits were no longer there. The strange thing is that now that the work is almost finished, its painted, it stands up, is photographed, now that the one hundred texts are written and the music is being added to them, now that the one hundred people are really people whom I seem to have invented, summoned, written into being and made real, I realise that this work is much more about naming than it is about money. It is an attempt to get to the bottom of the dilemma of losing your name, being relieved of your real identity, being saddled with another more convenient or less embarrassing identity and how you then have to invent something else equally real simply to survive, to make sense of being alive. It is the story of the slave/servant, but also of the leper, of the migrant, of the refugee, of the asylum seeker. If it is true and people are more real in who they are and therefore more important when their name and family history is written down and they live in the same place for generations, if this is really what makes you worth something then this is what I have tried to do here in this piece, with these people. This is just a short letter to explain to you why I changed my mind and the show is now 100 life sized wooden cut-outs and not the 10 canvas paintings I said that it was going to be. The whole thing developed from an idea I have been grappling with since 40 painted tin plates formed part of a piece called Study for a Monument (1992) each plate tumbled off a table painting and represented countless Africans who were once makers/creative/active people and whose lives were chucked away as they were thrown overboard, surplus to requirement on their way from their home to a life of slavery. The ten paintings once planned would have retained the original title of Gifts to Kings and have simply replicated the 3 works I saw in the early 1980s in La Rochelle in western France . These were beautifully painted portraits of black people who were given as presents from the king of Spain to the king of France. The fragments of fabric from your collection would have featured more prominently and been painted into their waistcoats, jackets and dresses. It would have been neat and tidy, rather beautiful but rather distant; another country, another time. It just wasnt enough. The hundred cut outs have been much more interesting to do. As I made the painted and collaged paper- works I became really excited by the endless possibilities for colour, texture, collage, drawing and text but by the time Id made a few dozen actual cut outs and each decision about the clothes, objects, expression on the face of each person I had made was different, the process opened up more opportunities for dialogue between the cut outs themselves, between now and then, between art and politics. The dog trainer, the ceramicist, the painter, the herbalist, the shoe-maker, the map-maker, the dancing master and the viol da gamba player the drummer and the toy-maker are multiplied by ten. They cluster together they can stand apart they think talk and remember. They plan ahead and dream of change. Its true it was daunting to have 100 blank cut outs all around the studio and filling the hall, but they have gradually come to life over the past ten months. I have had to deal with solving the problem of how to get them to stand up, then the challenge of naming them and writing each ones story. The size of the project and the worry of it went backwards and forwards from being about cash flow and budgets to reputation and skills and finally was resolved by being able to listen; to my many technical advisers and to the cut outs themselves. We are in the middle of making the soundtrack, the texts/stories and 80 minutes of music interplay and interweave . It will be playing in the gallery and hopefully add another layer to the experience. Its taken hours of discussion, recording, more discussion and then some technical wizardry, it was like writing and recording a small opera. The voices speaking, the urgency of writing what they said on paper, the way some simply waited their turn knowing I would get there eventually. Many people have worked on the project so far, apart from the sound advisers there have been people cutting out, making and designing the stands, delivering them to the workshop and back to the studio. As the autumn came I had to hand over the whole management of the project so that I could concentrate on the making all the time. Our budget didnt really allow for this so as usual my wage packet is stretched to its limit. Naming the Money indeed. All the research into the textile fragments appears as such a tiny visual now but the presence in your collection of that partial yet tangible history will be very important to the final installation perhaps because they will be hard to see. Tin plates multiplied by French paintings added to Hatton textile fragments multiplied by a history of cut outs, interspersed with slave narratives, overlaid with favourite music equals Naming the Money. The placing and grouping of the cut outs is both clear and vague at the moment. There are groupings I always had in mind like the drummers, dancers, and viol da gamba players being all together in a huge boisterous, space taking, loud, gathering. I can see the dog trainers dotted about throughout the whole installation communicating with their animals. The ceramicists and painters have a great deal to say to each other and the herbalists and ceramicists do too, the ceramicists talk a lot. The shoe- makers stand alone looking at other people, the map makers stand alone ruminating about their lives, how hard they work, what might have been. The toy-makers are interested in children but I cannot place them as there arent any children. It will have to wait until the dummy run next week. Its easy to see why you want to know about my cut outs but really difficult to explain why I make them. I know what they are; history paintings, portraits, political treatises, stand ins, adverts and effigies. I know what they are not; sculpture. Ive made more than 200 of them in the past 30 years, 100 in the past year alone and even though these are more free standing than they have been before, they are paintings. The early ones I made in the 1970s were more like domestic furniture; almost empty fridges and tables with goldfish bowls, there were birds, trapeze artists, a Posture Master, and a black panther. I made cut out waiters with menus painted on for a restaurant I had helped design in Covent Garden, a head and shoulders of Stravinsky and another of David Hockney, all before I really became serious about what I wanted them to do. In the early 1980s I made the six notorious cut out men with their 3 foot penises, this work triggered my move into what became Black Art. They were white men, funny, a bit aggressive and therefore loved and loathed in equal measure. 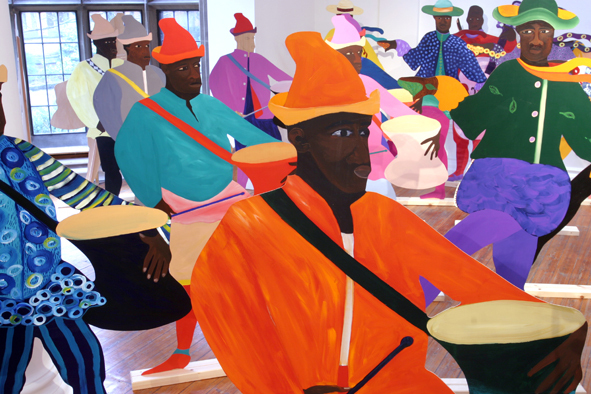 The mid 80s saw the heroes and heroines, Bessie Smith, Toussaint LOuverture, Yaa Asantewa, followed by the Carrot Piece for the show at the ICA, then Restoring the Balance and Fishing in which black figures enacted the rituals of reclaiming lost artefacts, refusing oppression and looking for ancestors. The reasons for making cut outs rather than paintings came from I think my training as a theatre designer and a desire to have art in the room, present, in the moment and not distant and framed within a rectangle. They were always meant to be part of the furniture the emphasis simply moved from domestic to public/political. In 1987 I exhibited in London at Pentonville Gallery, A Fashionable Marriage; an installation pastiche of Hogarth’s painting The Countess’s Morning Levee. It was a satirical attack on funders, critics, artists, politicians and the hypocrisy of an art world that mirrored the political world but was too duplicitous to admit it. The making of this installation spanned two periods of my life in London and out of London I left the capital and lost my sense of who I was and had been, which forced me to try to find another self, this time one that would sustain me for ever. The search continues. It took until 1994 to get around to making another cut out installation. This time I chose to unpack the pre-occupation with celebrity, recognition, fame through art and the idea of the idea of the studio. What does a woman’s studio look like? Twenty-four cut outs of famous women artists depictions of women artists depictions of women. It was shown in Glasgow at Transmission to great critical silence and in Cuba at the 5th Havana Biennale to a delighted audience. This installation offered the first real chance to enter the space in which the cut outs stood. It was possible to walk around them and spend time testing your knowledge in an attempt to guess the identity of each. There were no names. It has taken another ten years for the time to be right again and the reason is obvious really looking at it from here. Cut-outs are fabulous to make, ludicrous to store, audience friendly and critically challenging. Why do it? I love to prove to myself that I have the freedom to make whatever work I like. Cut-outs do it for me. They are a rather English form and the first date from around the early 17th century here. They were made for many reasons; as visual jokes, as covers for empty fireplaces in the summer and as companions. They were often servants; gardeners, maids, cooks, footmen, sometimes soldiers, sometimes pedlars and even saints. They advertised army recruiting offices, they were used to guard doorways and as theatrical extras to advertise tobacco and snuff. Interestingly they were made in East Africa as memorial effigies from wood and plaster, decorated with pigment and cloth to honour important dead elders who were members of a secret society, their names carved on the front. Alex Katz started to make them in New York in 1959; he didnt like the background in a painting so he cut out the central figure and mounted it on a plywood panel. They gradually evolved from wall based to free standing figures. His fans think he invented the form. Mine are a mixture of all these influences, even though I was only aware of the 17th century English ones until the mid 1980s. They are real but are like toys, they are big and have a presence but take up very little space. I become very fond of them, nonjudgemental friends, sturdy compainions mirrors and fantasy figures all in one. I hope this letter sorts out for you the why, as well as the what and the when of my love affair with the painted portrait cut-out. You will understand also I hope that even at 50 years old in 2004 having made them on and off for the past 30 years I cannot quite say I will never do it again.